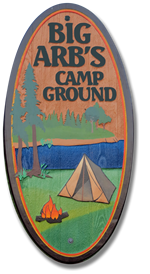 Big Arb's Campground is a beautiful 75-acre camping facility. It is located about five minutes east of Minerva, Ohio one mile north of route 30 just off Rochester Road. Forty acres are wooded with hiking trails. One may see deer, wild turkeys and other wildlife. 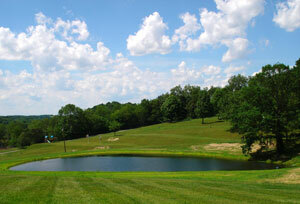 On the grounds are a heated swimming pool, and two ponds. We also have a 40x120 ft. pavilion that has clean hot showers, a store with a snack bar and a shelter area that has seating for over 120 people. The shelter also has a variety of electronic games, and a pool table. The campground is comprised of many campsites. Water and electric are available at all campsites. Some campsites have a choice of 20/30/50 amp electric service. Many of the campsites also have sewer hook-up. A dump station is available for those sites that do not have a sewer hook-up. There are two children's playgrounds for the youngsters. For those a little older, there is basketball and a sand volleyball court. Fishing is allowed at the ponds but please catch and release. There are many AREA ATTRACTIONS close-by! During the season, a number of events are held at the campground. Live entertainment is available on the holiday weekends and some other weekends including bands, DJs and Karaoke. Bingo, Texas Hold Em, Euchre and other games are held frequently. There are events and games for the kids as well. We will be expanding our event calendar as the season progresses. 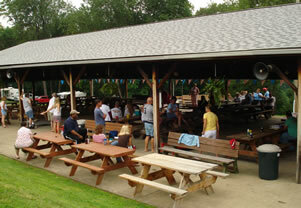 The pavilion is available for company picnics, Church groups, family reunions, etc. by reservation. 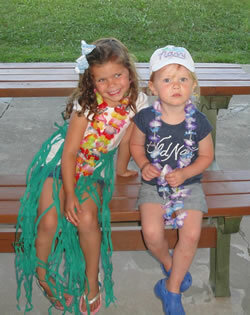 Campsites are available by reservation or on a first come basis. Campfires are allowed and firewood is available for sale through the campground store. Propane is available as well as a number of other necessities and souvenirs. Patty and Jim McGeorge and Marie Sukosd are the campground managers.